Lovers of the hockey game need not be introduced to Corey Crawford the Canadian professional ice hockey player who plays as a goaltender and is admired for catching with his left hand. As of 2019, he plays for the Chicago Blackhawks of the National Hockey League (NHL), a franchise that he has been with since making his professional debut in 2003 the year he was selected during the NHL entry draft as the 52nd overall. Despite the many injuries he has had to surmount, Corey aka Crow remains a vital cog in the Blackhawks wheel. Let’s find out more about Corey Crawford. Corey Crawford was born on 31 December 1984 in Chateauguay, Quebec, Canada to Trevor Crawford (father) and Sylvia Crawford (mother). He has an older brother by the name Trevor Crawford. Crawford speaks both the English language and the French language fluently. As a child, Crawford always aspired to become a professional National Hockey League player. He started his pre-junior career with the Midget AAA Gatineau Intrepides and later went ahead to join the Quebec Major Junior Hockey League’s Moncton Wildcats. Crawford tended the goal for the Wildcats in the 2003-2004 Quebec Major Junior Hockey League (QMJHL) playoffs where they defeated the Rimouski Oceanic in the semi-finals of the game to proceed to the President Cup final but eventually got defeated by Gatineau Olympiques. The 2003 NHL Entry Draft saw him drafted 52nd overall by the Chicago Blackhawks. He presently possesses the Wildcats record for most wins, lowest goals against average and on the same scale with Simon Lajeunesse for most shutouts in a season. The 22nd day of January 2006 will always remain a special day for Corey. It was the day he made his National Hockey league debut with the Blackhawks in a game against the Minnesota Wild. His stats were outstanding as he made 7 saves conceding no goal. The following month, Corey Crawford had impressed his coach enough to put him in the starting lineup. It was a match against the St. Louis Blues and Corey made twenty-nine saves, conceding 5 goals. The game ended in a shootout where his team lost 6-5. Improving on his game as the weeks went by, Crawford bagged his first professional win in March 2008 in a match against the Anaheim Ducks which ended in a shootout. His Stanley Cup playoff debut came in May 2009 in a match against the Detroit Red Wings. He came in as a substitute in the game which was a Western Conference Finals replacing Cristobal Huet in the second period. By the 2010-2011 season, Crawford had developed himself enough to earn the role of the back-up goaltender to Marty Turco. Subsequently, he would come to replace Marty Turco as the starting goaltender. Crawford wrote his name in the history books by winning 8 straight games between the 20 of February to the 5 March 2011. This set a new record for the longest winning streak for a rookie. Corey holds the record as the first Blackhawks goaltender to reach the 30-win, a feat he achieved on 28 March 2011. The player was among the six selected through fan-vote to play in the 2015 National Hockey League All-Star Game. He missed out in quite a number of games in the year 2017 and 2018 due to injuries he sustained. Also Read: Who is Mike Hoffman (Ice Hockey Player)? Does He Have a Girlfriend or Wife? Corey Crawford has achieved the millionaire status, thanks to his talent as a hockey player. He has been well-rewarded for his career-long loyalty to the Blackhawks. His first big contract with the franchise was inked in May 2011 and put his annual salary at over $2.5 million – it was a 3-year contract worth $8 million. After it ended, he was rewarded with a bigger deal that surged by over double to $6 million yearly. The contract signed in 2013 was worth $36 million with a lifespan of 6 years. Is He Married, Who is The Wife or Girlfriend? 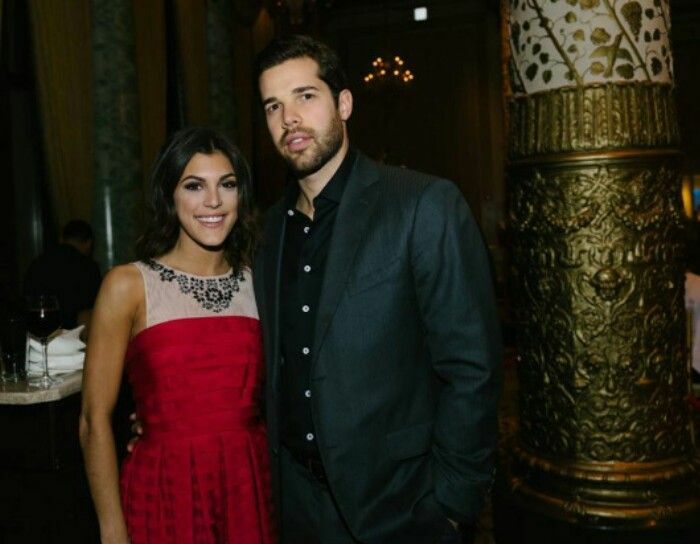 Corey Crawford has been in a long-time relationship with his girlfriend Kristy Muscolino. Kristy is an assistant account executive at Havas Worldwide. Originally from Chicago, Kristy and Crawford kicked off their relationship sometime in 2014 after the player called off his engagement with his long-term partner, Silvier Cormier. The couple welcomed their first son, whom they named Cooper Crawford in September 2017. Although the pair have been living together for over four years; they are yet to make it down the aisle. We hope they do that soonest. Corey Crawford stands at 6 ft. 2 in. (188 cm) and weighs 94 kg (approx. 208 lbs). The ice hockey star has won the Stanley Cup Championships for three times in 2010, 2013 and 2015. During his rookie year – 2011/2012, Crawford impressed so much and was deservingly awarded a berth on the National Hockey League All-Rookie Team. The William M. Jennings Trophy is another accolade that he is no stranger to, winning it twice in the 2012-13 and 2014-15 seasons. Crawford’s record with the Chicago Blackhawks is an enviable one. For the first time in the team’s history, Crow on the 23rd of March 2015, became the Fourth goaltender to have four 30-win seasons. The goaltender’s career was threatened in December 2016, when an emergency appendectomy procedure was performed on him in a facility in Philadelphia.